Nemco 67763 2-Hole Steam Table Adapter Plate 11 Qt. TigerChef > Smallwares > Steam Tableware >< Steam Table Pan Adapter Plates > Nemco 67763 2-Hole Steam Table Adapter Plate 11 Qt. $10.09 Thunder Group SLPHAP066 Two Hole Adaptor Plate with Openings 6-1/2"
$10.09 Thunder Group SLPHAP088 Two Hole Adaptor Plate with Openings 8-1/2"
$69.85 Nemco 66093 2-Hole Steam Table Adapter Plate 7 Qt. $81.95 Nemco 68592 4 Hole Steam Table Adapter Plate 4 Qt. $102.85 Nemco 67410 4-Hole Adapter Plate for Round Inset Pans (2) 4-1/8 Qt. and (2) 11 Qt. $74.80 Nemco 67411 3 Hole Adapter Plate for Round Inset Pans (2) 7-1/4 Qt. 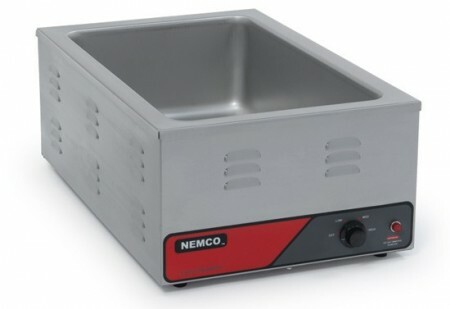 and Steam Table Pan (1) 12" x 20"
Use the Nemco 67763 2-Hole Steam Table Adapter Plate 11 Qt. to support and hold bain-maries and round insets in a full-size warmer at your buffet. Designed to fit snugly on Nemco 6055A-43 warmer, this item seals in heat and reduces energy consumption. Thanks to its two holes, this product holds 11 Qt. capacity insets, perfect for serving different menu items at the same time. Made from rust-resistant stainless steel, this high quality adapter plate is easy to clean and provides unbeatable durability.